How does Quincy Farm's CSA work? Community Supported Agriculture (”CSA”) is a fantastic way to connect people to a small local farm, build community, and get excellent quality naturally-grown vegetables. CSA members support the farm by paying a portion of the season’s expenses in advance; the farmers then grow, harvest, and wash the produce, delivering it to a convenient pick-up spot each week. When you arrive at the distribution location, you'll find the boxes of freshly picked veggies already laid out waiting for you--the items in this week's share are clearly written on a chalkboard, so you know exactly what to take and how many of each... if there's any unusual items, there will be labels right on the box, too. You then check your name off the sign-in list, collect your share into your own bag or container, and go home to enjoy it! If you can't make it to the pickup one week, you can have a neighbor or friend come pick up your share. If you can't make it at all, don't worry, nothing goes to waste--any leftover veggies are automatically donated to a food pantry after distribution. When & where do I collect my veggies? Ballston Spa: Pickup is on Tuesday afternoons at the Christ Episcopal Church on High St in Ballston Spa (click HERE to see a map), from June 11th to October 29th. Arrive between 4pm and 7pm to collect your veggies--don't forget your reuseable shopping bags and/or plastic for the greens. Pull in the driveway on High St, west of the Church, and there is parking near the entrance to the distribution space in the back. Glens Falls: Pickup is on Tuesday afternoons at the Glens Falls YMCA, at 600 Glen St / Route 9 (click HERE for a map), from June 11th to October 29th. Arrive between 4pm and 7pm to collect your veggies--don't forget your reuseable shopping bags and/or plastic for the greens. Drive past the front entrance of the YMCA. Come in through the back entrance, check in at the desk--you don't need to be a YMCA member to pick up CSA shares--and walk down the hallway, then turn left (follow the Quincy Farm signs). Malta: Pickup is Tuesday afternoons at the Beauty Society Salon, at 123 Dunning St, east of the northern 9/67 traffic circle (click HERE for a map), from June 11th to October 29th. Arrive between 4pm and 7pm to collect your veggies--don't forget your reuseable shopping bags and/or plastic for the greens. Pull in the driveway and come to the little garage building behind the salon! 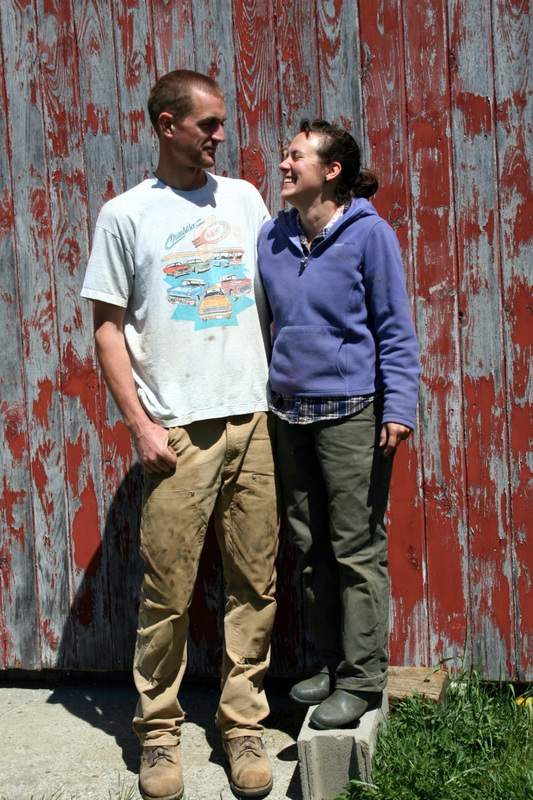 Easton: We'll have an on-farm CSA option starting 2014, and we'd love to have you! You can be added to the waiting list through the form at the bottom of the page, and please think about joining one of our other sites in the meantime! Clifton Park: TBD for 2014. What can I expect in a share? 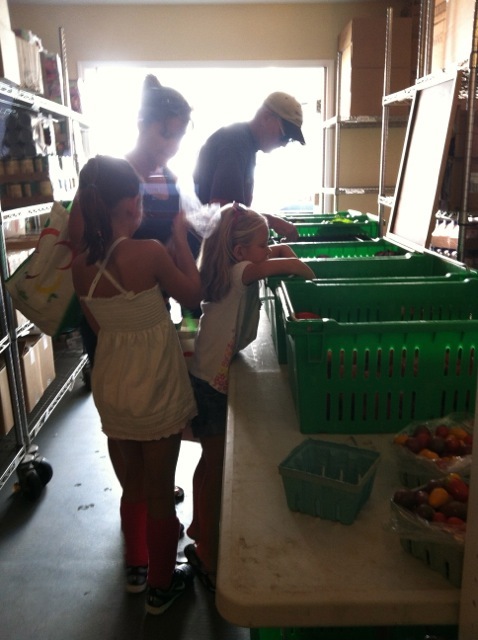 Quincy Farm CSA shares are planned to feed an average family of 2-4 a reasonable week's worth of produce... There's a weekly online feedback form that we look to for input on the share size and content, and though we ask every week, it's rare for anyone to reply that the share was the wrong size. We aim to provide 7 to 12 different delicious items each week, creating a tasty diversity of veggies within each share and also week to week. You'll get sweet tomatoes and peppers, fresh lettuce and greens, crunchy carrots and beets and radishes, flavorful onions and garlic, and a lot more. We actually have 352 different plantings this season, and it's the freshest food you can get--our afternoon distributions and the inherent efficiency of CSA mean many items are picked the very same day you receive them! This season we unfortunately won't be growing sweet corn or potatoes (two of our favorites) because we don't yet have the equipment to do so reasonably, but we promise to make it up with delicious alternatives. We also don't grow fruit, though we may partner with a neighbor to provide a fruit option in future seasons. We plan a balanced CSA share for each week, providing new and fun vegetables for you as well as keeping your family full with lots of favorites. There's a "swap box" at each distribution to facilitate trading between members, but we encourage you to try the unusual items, too--you might find a new gem! To help out, each week's newsletter also provides a couple great recipes for inspiration, as well as an idea of what to expect the following week. We're excited about the variety and quality of veggies we grow, and we think you will be, too! Does Quincy Farm offer half shares? We want all of our members to get an excellent, balanced and generous share--think about the logistics of splitting 1 watermelon or 7 tomatoes and you'll see the inherent challenges of "half" shares. If you think a full share might be too much, find a friend to share the bounty--either meet up after distribution and divide the share as you see fit, or coordinate with one another to each pick up on alternating weeks. If you can't find someone, let us know and we'll keep an ear out. Also, remember that any unclaimed produce goes to the church's food pantry after distribution, so nothing's going to waste if you feel like you can't use an item or two one week. We do ask that if you're sharing a share, that only one person collect the vegetables each week, and then if necessary you split the share later. We also ask that just one person pay for the entire share, and you work out the finances between you. This helps keep things flowing smoothly at distribution, and allows us to focus on growing great food. Do I have to come work on the farm? But we do host several "farm days" each season when everyone can come see the farm, help out a little, and share a meal and some great company. We'll have some group farm-work in the morning that requires many hands but little skill, then a tour and a potluck for lunch. These days are totally optional, but many members really cherish them as a great connection to their food. What does a share cost? A Quincy Farm CSA share costs $495 for 21 weeks worth of deliveries, from the beginning of June to the end of October. It's a little over $20/week. You can sign up for the season's share any time after January 1st--the earlier the better! Item for item, our CSA shares are more economical than buying the same produce at the farmers' market or in a store. We think it's a great deal, and you're supporting your community and meeting your neighbors in the process! Is there financial aid, an installment plan, or a work share? We believe that everyone should have access to fresh, nutritious food. Unfortunately, right now we don't have the means to offer installments or aid. It's something that's important to us, though, and it's something we hope to explore in the future. We don't trade farm-work for CSA shares because it's important to us that workers here on the farm WANT to be here working, rather than feel they're paying something off. If you think it'd be fun to help out at one of our weekend farmers' markets--and it is--we'd love your help, and then there's the possibility of taking home veggies that haven't sold at market. Once we've received your enrollment, electronically or in the mail, we'll send out a confirmation welcoming you to Quincy Farm and the best veggies in the capital region, as well as a short member survey so we can get to know you. Thanks... We look forward to being your farmers!